The “Education and Training 2020” work programme (ET2020) was adopted in May 2009. In line with the Europe 2020 growth strategy and building on the previous work programme ET2010, ET2020 defines the long-term strategic objectives of EU education and training policies: making lifelong learning and mobility a reality; improving the quality and efficiency of education and training; promoting equity, social cohesion and active citizenship; enhancing creativity and innovation, including entrepreneurship, at all levels of education and training. The Lifelong Learning Platform closely follows the implementation of this work programme, notably during the European Education, Training and Youh Forum organised by the European Commission. It also participates in the ET2020 Thematic Working Groups run by DG EAC and DG EMPL. To better understand the processes of the ET2020 have a look at our LLL-P Guidebook in education. It contains up-to-date and relevant information for you! 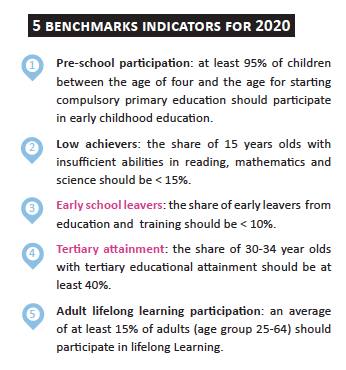 On 8 November, the LLLPlatform published a press release in reaction to the newly launched Education and Training Monitor 2016. This volume aims to support setting up skills forecasting systems at national level by means of quantitative and/or qualitative approaches. In the wake of the technological revolution that began in the last decades of the 20th century, labour market demand for information-processing and other high-level cognitive and interpersonal skills is growing substantially. Read the study. In recent decades there has been a strong move towards evidence-based policy making in the public sector. Few education policy-makers today would dare to introduce a reform that is not backed up by data and research evidence. But what is the nature of evidence being used, and can we rely on it to make better policy? Read the Eurydice focus on educational evidence and policy.